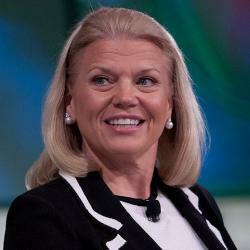 Did Ginni Rometty become CEO of IBM because she was loyal? Ginni Rometty of IBM in 2011 at the Fortune Most Powerful Women Summit. Photo by Asa Mathat/Fortune Live Media via Wikimedia Commons. On Tuesday, we learned that Ginni Rometty, a 30-year veteran of IBM, would become the first woman to head up the company in its 100-year history. The next day brought the news that 20-year company veteran Heather Bresch will take over the same spot at pharmaceutical giant Mylan. Between Rometty and Bresch, they have 50 years of experience at the two Fortune 500 companies where they received the ultimate career accolade. Coincidence? Unlikely. Earlier this month Catalyst, the advocacy group for women in the workplace, released a study demonstrating that female MBAs, as opposed to their male counterparts, fared best when they eschewed job-hopping. According to the report, “The Myth of the Ideal Worker: Does Doing all the Right Things Really Get Women Ahead?,” women who changed jobs two or more times earned significantly less money than those who remained with one employer for a long period of time. This was not true for men, who enjoyed greater wages if they left their first position. The good folks at Catalyst speculated that men are rewarded for their potential, but that women need to demonstrate they are capable before they are taken seriously. Adding credence to this analysis, Catalyst found that women have to be their own best publicists, telling their colleagues about their accomplishments, and actively seeking out mentors and influential patrons who can steer plum assignments their way. Men? They just need to show up and network. About those all-important mentor types, according to a survey released this week by LinkedIn, women find it harder than men to find the consiglieres they need so badly, with more than half of all Baby Boomer women reporting that they were never once mentored by another woman. Two-thirds of those who had been mentored were counseled by men. There were signs of progress in the LinkedIn survey. They younger the woman, the more likely she was to be mentored by other women, with more than half of Generation Y women reporting such an experience. Hopefully Rometty, who spoke eloquently about the help she received from mentors at Fortune’s Most Powerful Women Summit earlier this month, is doing some of that work herself.